Play starts with a pass to the strong side. 5 moves to the middle post. 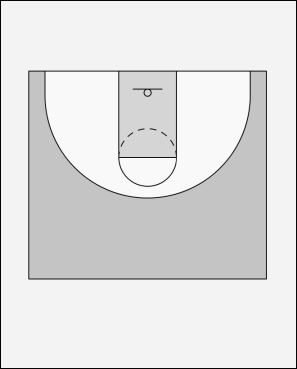 2 passes to 4 and curls around 5. When 2 passes 5, 4 dribbles up to create a triangle. 4 passes to 2 in the short corner. No pass to 2 swing the ball to the other side. 2 cuts to the other side. Repeat until pass to the short corner. Skip the pass to the short corner, 4 passes back to 1 to swing the ball and cuts directly to the other side.